Our range of 4 pole Cliffcon®s are available in straight or 90° versions and have now been designated low voltage (blue) and high voltage (red). CliffCon® Blue (LV) is for uses under 120V AC such as speakers, amplifiers, battery chargers and vehicle use. Maximum current at pole is 20A, (30A). CliffCon® Red (HV) is for uses up to 250V AC such as lighting and power connections. Maximum current at pole is 20A, (30A). Only plugs and sockets of the same colour color are compatible, so red plugs cannot be plugged into blue sockets and vice versa. This allows the use of both kinds of connector on the same equipment with no chance of mismatching the connections. Convenient Faston, screw and solder connections. Chassis connectors are air-tight and fit the same cut-outs as our XLR connectors. Our original black versions remain available. However, we suggest users change to the HV and LV versions for new designs. 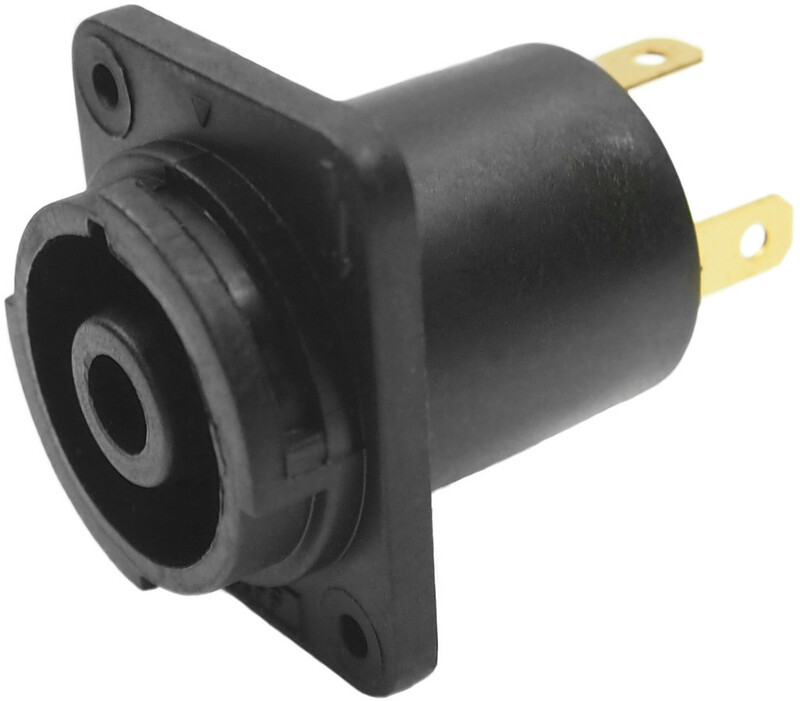 Rated Current: 4 pin 20 A RMS @ 80°C, 30 A RMS @ 20°C (5% usage). Rated Voltage: Blue (LV) 120 V; Red (HV) 250 V AC maximum, (connections electrically identical, only the designation is LV and HV). Contact Resistance New: < 3 mΩ. Capacitance between Terminals: < 1.5 pf. Insulation Resistance: > 20 MΩ @ 4000 V.
Inrush Current: > 30 A / 20 mS.
Operating Temperature: -20 °C to +80 °C. Recommended Wiring: 1+, 1- CH A (L) 2+, 2- CH B (R) pin 1 designated for earth ground (+ inphase, - ground). Maximum Wire Size: 6 mm² / 10 AWG (solid); 4 mm² / 12 AWG (stranded). 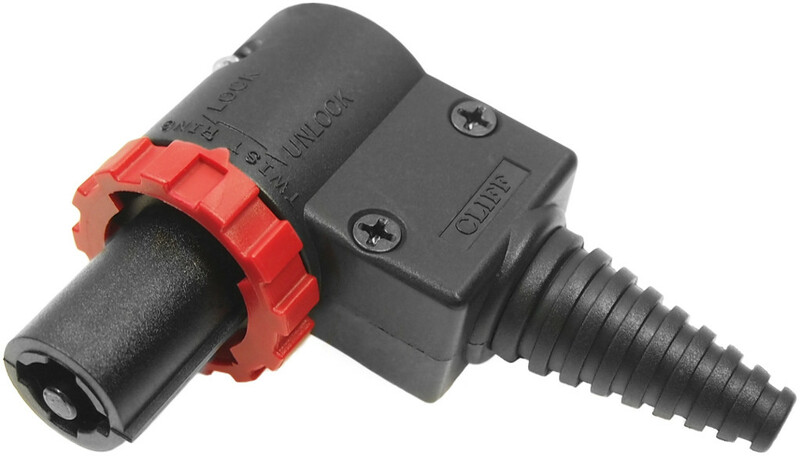 See the PDF data sheet: CliffCon® 4 Pole Connectors (opens in a new window). FCR2066 4PC/P/LV CliffCon® 4 pole, low voltage connector plug. FCR20663 4PC/P90/LV CliffCon® 4 pole, low voltage, right-angled connector plug. FCR2068 4PC/S/LV CliffCon® 4 pole, low voltage, connector socket with solder tags. FCR2067 4PC/P/HV CliffCon® 4 pole, high voltage connector plug. FCR20673 4PC/P90/HV CliffCon® 4 pole, high voltage, right-angled connector plug. FCR2069 4PC/S/HVPC CliffCon® 4 pole, high voltage, connector socket with solder tags. 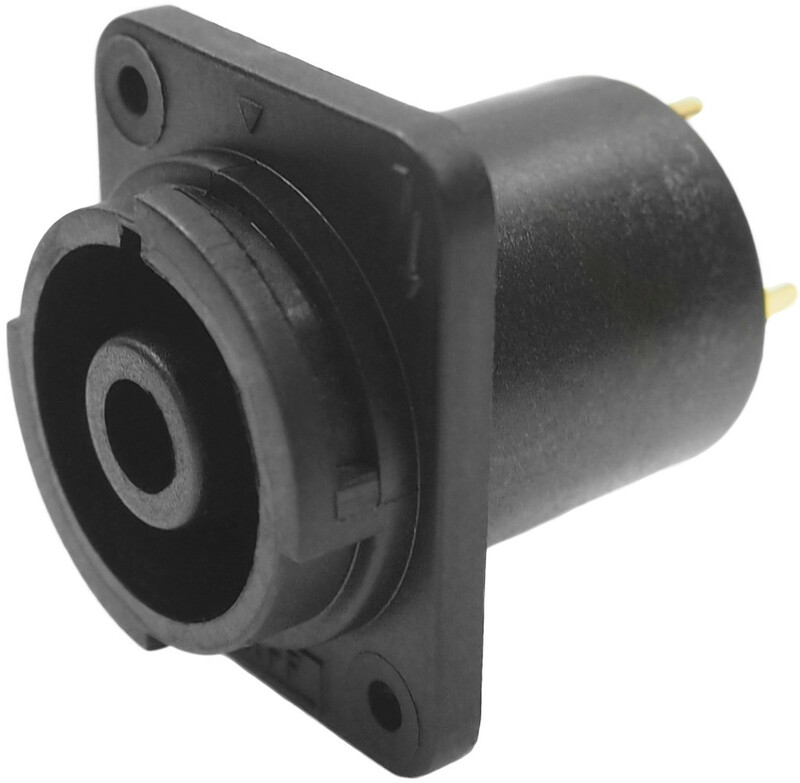 FCR6929 90° adapter. Fits on to 4 pole CliffCon® plugs to allow 90° PCB mounting. FCR2062 4PC/P CliffCon® 4 pole, high voltage connector plug, black. FCR2063 4PC/P90 CliffCon® 4 pole, high voltage, right-angled connector plug, black. FCR2064 4PC/S CliffCon® 4 pole, high voltage connector socket with solder tags. FCR20642 4PC/S/PC CliffCon® 4 pole, high voltage connector socket with PCB tags. FCR2065 4PC/L CliffCon® Line Connector.